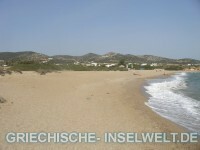 The nudist beach lies to the north of Antiparos east of the campsite. The beach is characterized by a very good situation and a good beach quality. There are fortunately no sunbeds and shade can be only limited found in the hinterland. Even as a non nudist you can stay here, nudism is not compulsory! 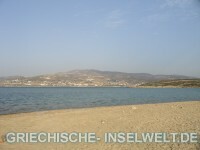 The beach is almost the city beach of Antiparos. When you arrive by boat, you can see him north. The beach provides a good, albeit solid sand quality. 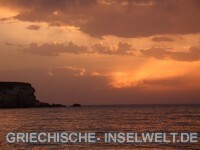 The Psaraliki Beach consists of two beaches, which lie side by side. One is called Psaraliki 1 and the other Psaraliki 2. The beaches can be reached easily by foot. Follow the road from Antiparos town to the south, in the first right turn, turn left and follow the road. The beach is also well-suited for children, this proofs the many sand castles and other sand objects. 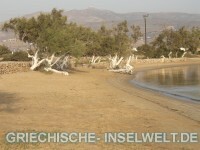 Overall, the beaches are quite beautiful and you have a very good view to the island of Paros. Soros Beach on Antiparos is a 350 metre long, rather bright and fine gravel beach. There is no shade on the beach. Fortunately there are no umbrellas or sunbeds. Nudism is not common even in the low season. The beach is very nice for Antiparos and still quite unspoilt, but in the last few years some houses have been added, which so far do not disturb further. In the low season you have the beach almost to yourself. 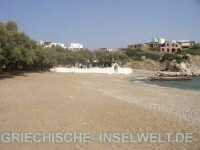 Apandima Beach on Antiparos is an 80 meter long beach with medium light and coarse sand and small rocks. The water does not necessarily invite you to walk in, as there are larger stones in some places. Along the beach some trees provide shade. There is also a jetty in the bay. Here the ships lay to bring the visitors to the cave. Overall, the beach is quite nice for a short break with snack in the adjacent restaurant, as there are nicer beaches nearby.